Chemically modified inhibitors of the COX-2 enzyme relieve anxiety behaviors in mice by activating natural “endocannabinoids” without gastrointestinal side effects, Vanderbilt University scientists will report next week. Endocannabinoids are natural signaling molecules that activate cannabinoid receptors in the brain, the same receptors turned on by the active ingredient in marijuana. These receptors are also found in the gastrointestinal system and elsewhere in the body, and there is evidence that they play a role in wide range of physiological and pathological processes, in addition to modulating stress and anxiety. If the “substrate-selective” COX-2 inhibitors developed at Vanderbilt also work in humans without side effects, they could represent a new approach to treating mood and anxiety disorders, the researchers conclude in a paper to be posted online Sunday in the journal Nature Neuroscience. 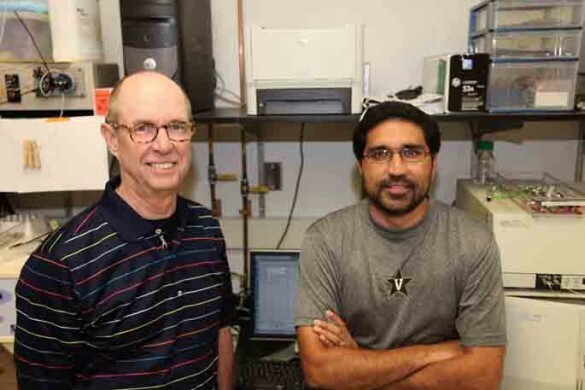 Clinical trials of some of these potential drugs could begin in the next several years, said Lawrence Marnett, Ph.D., director of the Vanderbilt Institute of Chemical Biology and the paper’s co-senior author with Sachin Patel, M.D., Ph.D. The Vanderbilt scientists are pursuing other potential applications of activating endocannabinoids by substrate-selective COX-2 inhibition, including relieving pain, treating movement disorders, and possibly preventing colon cancer. Aspirin and other non-steroidal anti-inflammatory drugs (NSAIDs) relieve pain and inflammation by blocking either or both of the cyclooxygenase (COX) enzymes, which produce pro-inflammatory prostaglandins. It has been known for several years that COX-2 inhibition also activates endocannabinoids. Because the “substrate selective” inhibitors developed at Vanderbilt increase endocannabinoid levels in the mouse without blocking prostaglandin production, “we think (they) will not have the gastrointestinal and possibly cardiovascular side effects that other NSAIDs do,” said Marnett, University Professor and Mary Geddes Stahlman Professor of Cancer Research. Daniel Hermanson, a graduate student in Chemistry, was first author of the paper. Other co-authors were Nolan Harley, Joyonna Gamble-George, Naoko Brown, Brian Shonesy, Ph.D., Phillip Kingsley, Roger Colbran, Ph.D., and Jeffrey Reese, M.D. The three-year-long study was supported by National Institutes of Health grants CA089450, GM015431, NS064278, DA031572, HL096967, HL109199, MH063232, NS078291 and MH065215.